The past week has been so hectic! We’ve been running around like mad chickens organising our trip to Indonesia for the homeschooling adventure on Gili Air near Bali. And now that I come to think of it, I might not have ever blogged about it here, though I did post something on Google+ HERE – My friend Bella is organising an informal unschooling retreat on this small island, the island is small enough that you can walk around it in an hour and a half, there are no cars on the island, just paradise, beaches and coral reefs. So the kids can free-range around and explore, while the parents lie on the beach drinking cocktails oversee that everything is educational. And set off on our four-week adventure! Only to arrive at the airport to find all flights delayed and cancelled due to bad weather! So we stayed at the youth hostel about 5 minutes’ walk from the airport. Which was kinda dismal, but at least cheap, and they had Table Tennis! The weather cleared somewhat overnight, and off we went to the airport again… Groundhog Day! All tired out before the journey even began, but undaunted (despite the looming 6-hour layover in Sydney airport – yay to our wonderful connections being messed up)! At least this time the plane was on time and everything went over smoothly! Now to organise ourselves for the next leg of the journey! 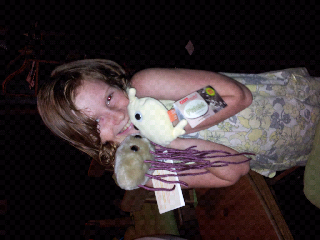 Littletree got some of the sought-after plush microbes that she wanted for her birthday. She's so excited about them; she got an e.coli and a platelet. So; it begins. Now she wants the whole set... And a proper microbiology lab. I want to write a tribute to Tsfira, who is Littletree’s paternal grandmother. While we got off to a bit of a rough start, we ended up really loving each other. She welcomed me into the family with an open heart. Tsfira treated me like her own daughter, took care of me when I was sick – even sat by my bedside and brought me home made chicken soup every day one time when I was in hospital! She’s one of the most open-minded, vibrant, beautiful people I’ve ever had the honour of knowing. It seems most people have some sort of battle-stories to swap about how awful their mothers are, or how rough the relationship with their parents is… some more than others, of course! But Tsfira is truly the mother everyone wishes they had. She is so incredibly caring, reasonable, supportive and loving. She didn’t agree with us unschooling Littletree at first, but she accepted a few John Holt and Alfie Kohn books and read them with a totally open mind, and in the end, respects our parenting choices and supports us, even in the choices she wouldn’t make herself. I feel truly blessed to have someone so caring and special in my life and I wanted to write this post for her birthday, which was already a week ago! Actually, I started writing this post weeks ago… I’ve been talking about writing it for months, maybe even more than a year, but in line with my current motto of no more procrastination, now is the time! So: happy birthday Tsfira, even a little belatedly. You are truly awesome, and I hope I’m even half as awesome as you by the time I’m eighty! Nine years old today! Which means that it’s my ninth birthing day! Littletree and I have been spending a bit of time away lately - going on adventures around Brisbane, visiting friends, seeing the big city and the countryside. We're staying at the moment with a friend, and I woke up this morning to find Littletree lying abed reading a book - a copy of The Poems and Histories of Shakespeare - a book whose title page is stamped "Published in London, 1901". Littletree didn't know when she picked up the book that it's 111 years old, but she knew there was something special about it. She's been engrossed in it all day, even if she can't fully understand every word she reads. Littletree’s latest passion for learning is focussed on microbiology – she spends a lot of time talking about various bacteria, reading up on them, looking online at all sorts of things and pouring over my medical textbooks. A friend of ours has a collection of plush microbes that Littletree is so excited about, and now she wants to start a collection of her own. 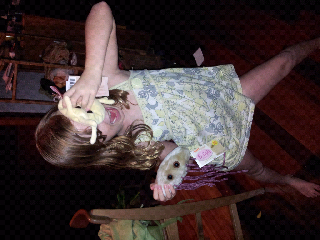 What’s not to love about learning microbiology through playing with stuffed salmonella-shaped teddy-bears!? So now Littletree has been spending time pouring over this website: http://www.giantmicrobes.com/au/ reading about the various microbes, cells and bacteria, learning the latin names that go with the common names, picking out her favourites, and hinting very loudly that her birthday is this month. Oh my word, how long before she wants actual cultures and a bio-hazard suit!